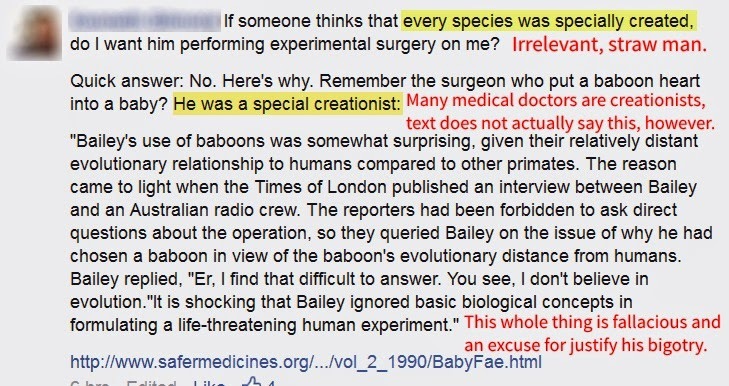 A "meme" that I used on a post 1 provoked some amazingly obstreperous and arrogant comments from anti-creationists. They misused logic and presented some remarks that were saturated with hate. These were predicated on what they considered a misuse of "science", the current definition of the Big Bang. My introductory remarks in the post said that the Big Bang was an explosion, and the article that I linked in the post had did not discuss the Big Bang, it was about other explosions. But they apparently didn't bother to read that one, they wanted to rip the "anti science" of calling the Big Bang an "explosion". Well, was the Big Bang an explosion? Or, more importantly for this article, is it justified to make such a remark? Yes, definitely. 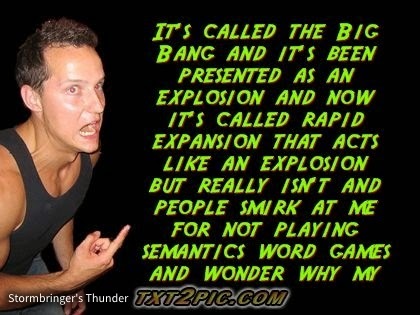 First, the Big Bang is called an explosion (or inferred by words like "cataclysmic") in dictionaries 2, 3, 4, 5, 6, but some must have received the memo that the "explosion" was upgraded to "rapid expansion" 7. Second, science-related sites including NASA, the American Museum of Natural History, National Geographic, PBS, BBC and others refer to it as an explosion 8, 9, 10, 11, 12, 13. "Atheism" is changed from the established meaning of "denial of the existence of God" 14 into the vacuous "lack of belief". "Vestigial organs" moves from meaning leftovers from our evolutionary past that we do not need anymore 15 (false!) into Coyne's "no longer performs the purpose for which it evolved" 16 (begging the question as well as conveniently redefining the word). Although everything came from "nothing", the word "nothing" now seems to mean "almost nothing, but we have to debate what nothing really means now" 17 . The Big Bang is now a "rapid expansion" 18, even though the thing isn't really understood in the first place and gets constantly revised 19, and we have a great deal of evidence that it did not happen 20. So, the Big Bang is not an explosion, it is a rapid expansion that moved faster than the speed of light 21 and pretty much looked like an explosion, it had previously been defined as an explosion, it really isn't, and if you call the Big Bang an explosion, you'll get slapped down by haughty pseudo-intellectuals who want to play with words. Pretty intolerant of them to be that way when people use completely understandable references to the Big Bang as an explosion. Hey! Like many other people, and with good reasons, I said the Big Bang is an explosion! In an article I wrote about how Christian persecution is increasing, I quoted Matt Slick as saying that people act in a manner consistent with their beliefs 22. Indeed, people are expressing irrational opinions. Sometimes they act on them. Bigotry begins with words, and persecution comes from that. It will only get worse. But we were told to expect that (Matthew 5.11, John 15.18-22). ADDENDUM: Nate has lied about me in the past, and helped prove my point with a worthless comment and loaded terminology. "Damage control"? An article that took about 3-1/2 hours to write and has over 20 supporting links is proving a point. Damage control? Not hardly!